Dryden Research Engineering staffers and Projects personnel have been flying a deployable, inflatable wing technology demonstrator experiment. The inflatable wing team, consisting of Jeff Bauer, Jim Murray, Joe Pahle, Tony Frackowiak, Bob Allen, and John Redmond, have worked hard to get the test vehicle, the I2000 radio controlled (R/C) airplane, to the project's current point of success. The inflatable wing project represents a basic, pure flight research effort answering the project's number one flight research question: "will it fly as the wings deploy in flight?" Three successful flights were flown. 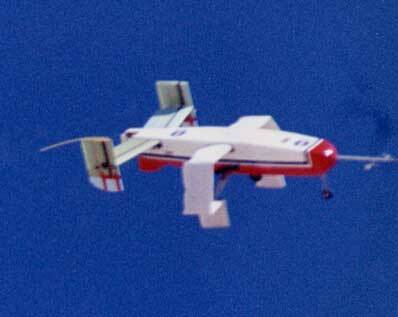 During the flights, the team air-launched the I2000 from an R/C utility vehicle airplane at an altitude of 800-1000 feet. As the I2000 separated from the carrier aircraft, its inflatable wings "popped-out," deploying rapidly via an on-board nitrogen bottle. The aircraft remained stable as it transitioned from wingless to winged flight. The unpowered I2000 glided down to a smooth landing under complete control. Recalling Hugh Dryden's vision for the purpose of flight research, Dryden's inflatable aircraft project manager Jeff Bauer noted that, "with these tests we have put some reality behind the many imagined applications for inflatable winged aircraft." Thanks to the efforts of the team, there now exists data to verify and validate computer models of inflatable wings for the future. The I2000 was equipped with a miniature flight data recorder designed by Jim Murray. That data, in addition to video and the photographic records, provide valuable insights into the aircraft's flight dynamics. "We are particularly interested in the dynamics of the vehicle during the rapid wing deployment, the transition from wingless flight to winged flight. We proved that we have a good flying vehicle during the transition to wings fully deployed," says project engineer Joe Pahle. Flight test of the I2000 followed a conservative "build-up" approach common in developmental flight testing. They began flying the I2000 with rigid wings having the same physical dimensions as the inflatable wings. Following successful flights with the conventional rigid wings, the actual inflatable wings were flown pre-inflated on the I2000. These risk reduction efforts were all geared to narrowing the possibility of trouble in launching and flying with the deployable wings. Tony Frackowiak of Dryden's model shop built all the glider models and R/C aircraft used in the project and served as the I2000 pilot. "There were no surprises since I was well prepared for the actual wing deployment flights," says Frackowiak. "We flew the I2000 build-up style in the powered mode with the wings pre-inflated. The drop and wing deployment was so smooth that the rest of the flight and landing was uneventful." Each inflatable wing is 2.7 feet-long for a wingspan of just over five feet, not including the fuselage. In the undeployed stowed state, the wings fit in a container the size of a small coffee can. Wing deployment time is typically on the order of 0.33 seconds, almost faster than the human eye can see. The specially designed wings utilize compressed nitrogen gas for the near-instantaneous inflation. A pressure regulator mounted on the nitrogen pressure vessel keeps the internal pressure of the wings at a constant 200-250 pounds per square inch (psi), reducing the possibility of wing-sagging due to low internal pressure or high external pressure. The nitrogen tank was pressurized to 500 psi in order to allow excess gas to make up any pressure losses in the wings due to leakage. With the I2000 flights completed, the project has as its next goal to fly a four-foot long X-24A model with the inflatable wings by the end of summer in hopes of proving the concept of using deployable inflatable wings with lifting body vehicle configurations. The X-24A model effort is a complementary but separate effort in demonstrating utility of inflatable wings. The X-24A shape was chosen due to the fact that it has a well-established aerodynamic database. It represents lifting body vehicles in general, and, in particular, has upper body flaps for additional roll control. The inflatable wings do not have flight controls, so the body flaps are critical for flight control. The I2000's tail surfaces filled the gap on that standard configuration airplane. The buildup to the inflatable wing X-24A flights will include flying the model with rigid wings first, the same procedure used for the I2000. Potential advantages of utilizing inflatable wings on future lifting body vehicles include providing greater cross-range and lower landing speeds than totally wingless vehicles. Potential future applications of inflatable wings include earth science aircraft, any volumetrically-limited aircraft, and planetary research aircraft. A Helios-type high altitude, long endurance platform could conceivably carry multiple, small deployable inflatable wing aircraft to release as "probes" to more closely investigate areas of interest located by the platform's sensors. The deployable inflatable wings were constructed by Vertigo, Inc., as a subcontractor for a U.S. Navy Phase II Small Business Innovation Research contract. The contract previously utilized the wings tested on a gun-launched munition to add glide capability to it. The resourceful Joe Pahle worked hard to acquire the wings following the Navy tests. Inflatable aircraft are not new. The Goodyear Tire Company built and flew several full-sized, entirely inflatable aircraft that carried a crew of two, under military contract during the 1960s. Not resting there, Goodyear lab-tested several small inflatable lifting body reentry vehicle models. These models rapidly inflated rearward out of solid ballistic reentry nosecones. The nosecones remained attached, forming the nose of the inflated vehicles. 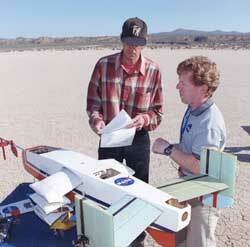 These tests were accomplished with crewed spaceflight applications in mind. However, these aircraft used low pressure (7-9 psi) air to inflate and keep the structures inflated. The wings of the Goodyear aircraft were not cantilevered, that is, they required external support in the form of cables running from the fuselage to the wings. The deployable inflatable wings used by Dryden team members are relatively high-pressure at 200-250 psi. The current wings are manufactured differently using an advanced high-pressure material known as Vectran. As they are cantilevered, the tough wings support their own weight as well as the weight of the aircraft in flight.